Practical Sigil Magic – Frater U.D. No matter what form your art takes make art every day. Art feeds your spirit. Every artist dips his brush in his own soul and paints his own nature into his pictures. Art hurts. It also urges voyages. Your talent is Spirit's gift to you. What you do with it is your gift back to Spirit. Art is a collaboration between Spirit and the artist, and the less the artist does the better. Every creative act involves a new innocence of perception, liberated from the cataract of accepted belief. Art is not living. It is a use of living. Creativity is Spirit's gift to you. What you do with it is your gift to Spirit. Art provides a healing force which aids both the maker and the viewer. Art is a means of bringing about a higher form of life. I am an artist at living. My work of art is my life. Art is the meeting ground of the world inside and the world outside. Make your life a work of art and your art a work of life. Medicine is derived from the Latin ars medicina, meaning the art of healing. Contemporary medicine treats, diagnoses, and prevents illnesses, diseases, and injuries primarily with medication or surgery. What is Traditional (aka Indigenous or Folk) Medicine? Traditional Medicine (aka complementary and alternative medicine) incorporates knowledge about plant, animal, and mineral-based medicines, spiritual therapies, and body manipulation techniques that has been developed over many generations. Indigenous Medicine is usually transmitted orally through communities, families, and individuals. Many indigenous communities have specific roles for healers such as shamans, medicine persons, witch doctors, sorcerers, magicians, witches, psychics, yogis, kahunas, seers, and midwives. According to Native American beliefs, Medicine is an inner power that is found in both Nature and all individuals. When determining is something is good, the question, “is it good medicine” is asked. Earth Medicine is a spiritual method of healing Mother Earth. In reverse, Earth Medicine is also the healing of humans by Mother Earth as they walk, lay, and pray on her surface. Earth-based spirituality honors all aspects of Nature and view Nature as a source of universal consciousness and energy. To create a supra-normal atmosphere for spiritual healing rituals. As sensory triggering mechanisms to expand consciousness and/or induce shamanic trance states. To access the higher self and to reprogram the powerful instincts of the lower self. To create representations of Spirits. To create symbolism as a means of interacting with the Spirit World. Shaman art includes: costuming, masks, sculpture, carving, petroglyphs, painting, sandpainting, bodypainting, tattooing, piercing, scarification, creating talismans and amulets, writing, metallurgy, and crafts. Performance arts include: illusionism, clowning, fire-walking, drumming, music, and dance. Navajo Sandpaintings These sandpaintings are created by a Medicine Person for healing or blessing ceremonies. Sandpaintings are created on the floor of a hogan. When complete, the client sits on the sandpainting where they are chanted over. The sandpainting is a portal for spirits to come to absorb the illness and take it away. The sandpaintings are begun, finished, and destroyed within a 12 hour period. Tibetan Buddhist Sandpaintings These are mandalas that the lamas create with colored sand over a period of days or weeks. Their subsequent destruction is then destroyed and in so doing heals and blesses the environment and all living beings. Art Therapy is a form of art medicine that is used in the mental health profession. The creative process enhances the mental and emotional well-being of individuals. The product of art therapy is used as a diagnostic tool with an individual’s subconscious. Art therapy uses art materials, such as paints, markers, crayons, clay, and sand tray. The process of creation is healing. The creation process focuses intentions for manifesting, affirming, banishing, relinquishing, or gratitude. The product can be used to heal others remotely or when given as a gift. The process can be used as ceremony or ritual. Using natural materials honors Mother Earth, Spirit Guides, and other spiritual entities.. 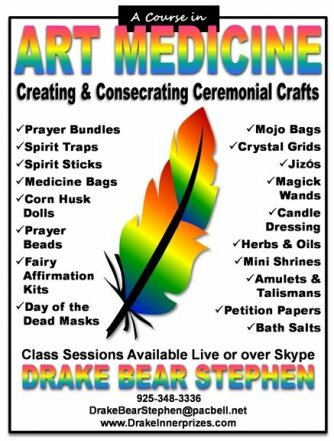 The product of art medicine is ceremonial crafts or spirit crafts. These items are created from natural materials that will be used for sacred or ceremonial purposes. These items can be placed on altars or in Nature, they can be buried, burned, or released in water, depending on the intent of the creator. Most medicine people create their own sacred tools because these tools amplify their personal power and focus their attention. Although used often interchangeably, there is a difference between ritual and ceremony. Healing Ceremonies - Performed for healing physical, mental, emotional, or spiritual wounds. Transition Ceremonies – Mark rites of passage in a human life or are initiations into new phases of life. Celebration Ceremonies – Observe recurring holidays, events, and celebrations. What will you use to in your invocation? Where will you conduct the ritual? When do you want to perform this ritual? Why are you doing this ritual? How will you accomplish your intention? Select a time and location. Purify yourself and the location. Make an offering. Establish protection and invoke sacred space. Perform ritual or ceremony. Include statement of intent. Separation - The beginning of a ceremony is when something is left behind and something new is about to begin. It is separating from the past. Transformation/Threshold/Initiation - The middle of ceremony is where release and renewal occur. It is experiencing the present. Incorporation/Integration – The end of ceremony welcomes and introduces the new identity into the world of daily life. It is future-testing the transformation. Set your intention before you design your craft. Focus your attention as you create your craft. Give gratitude when you are complete. Let your intention go and let it flow to the Universe. The entire process of creation is a ritual itself. The product of your creation can be used in ceremonies and other rituals. Water - Place under running water or dip in the ocean. Crystals - Lay on an amethyst or quartz cluster for 24 hours. Earth - Bury under the earth for 24 hours. Sound - Tibetan singing bowls, tuning forks or ring bells can be used. Smudge - By burning dried herbs and waving the smoke over and through it for 5 minutes. Sun & Moon - Energize in sunlight and moonlight for 24 hours each. The Universe’s energy is enhanced at these times: full moons, blue moons, new moons, eclipses, solstices, equinoxes, and specific astrological aspects. Salt or Crab Apple - Soak in a non-metallic container filled with water with some purifying sea salt or crab apple Bach Flower Remedy and place in the moonlight 3 days before the full moon. Sea salt can be mixed with water or used dry. Herbs - Bury in a cupful of dried herbs. Suggested herbs for this are: rose petals, sage, frankincense, myrrh, clovers, daisies, comfrey, and sandalwood. Pendulum - Hold a clear crystal pendulum over it and pass the pendulum in clockwise circles 9 times. To cleanse, pass the pendulum anti-clockwise 9 times. Keep the pendulum well charged and positive by holding it under cold clear running water and then leave it in water steeped with rose petals, over which a cleansing and empowering incense, such as pine, and a white candle flame have been passed. Visualization - Hold your item in either hand and say these words: I will and command that this be self-cleansing. 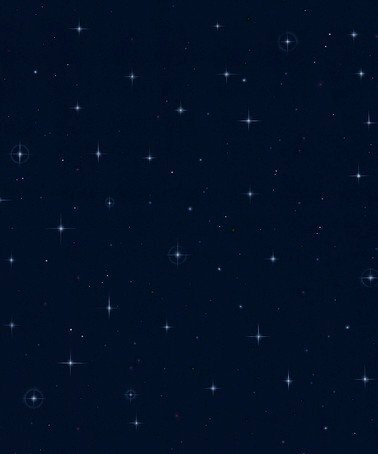 Visualize the negative energies falling away and natural, pure, energies remaining. Reiki – Infuse with Reiki energy (if you are an attuned practitioner). Florida Water – Spray or blow Florida water over the item. Cleansing the item: Smudge with white sage, Florida water, or cigar smoke. Energizing the item: Blow my intent into it. Breath is a powerful form of prayer. Infuse the item with Reiki (universal life force energy). Offer the item to be blessed by Mother Earth, Father Sky, the 4 Directions, the Ancestors, my Spirit Guides, and the 4 Elements. Say some words that set the intention of the item. No one, at any time, other than you, should touch your sacred tools. Their touch may change the energy with which the item has been charged. If the item is touched, you need to repeat the cleansing and energizing process again. The item that is being cleansed and charged should be used as soon as possible and after that as frequently as possible. This keeps the power connection alive. The best way to source materials for your creation is finding them in the natural world. Everything in the universe vibrates at a specific frequency. When choosing your materials, hold a variety of alternatives in your hands and see which one feels right for you. Different materials will feel right for you at different times, depending on what you are constructing and for what reason. Material that will want to be used will “call out” to you. Find them by going into a meditative state, walking along with a specific intent of being open to finding objects, and they will pop right out to you. If you believe you have found an item, open a dialog with it. Ask its Spirit for permission to be used in your sacred tool. If the item gives you permission to take it along, leave an offering of gratitude. To make an offering, hold your gift in your hand and present it up to Father Sky. Present your offering to Mother Earth to show appreciation. Hold it out to each of the 4 directions. Leave the offering while voicing your thanks and intention. In the North American Native tradition, tobacco is most often used offering, while the Celtic tradition uses salt or whisky. The offering can be anything that has special meaning to you and is in harmony with your magic: flowers, stones, coins, bee pollen, cedar, copal, cornmeal, juniper, lavender, rosemary, rose petals, sweetgrass, white sage, or something specially made such as bread or cake. If nothing is at hand, use your own spit or some of your hair. The most important part of creating your sacred items is intention. The entire process of creation should be done in a sacred and meditative state, constantly repeating the intention for the item you are making. Besides finding materials from Nature, shop at your local craft and hobby stores as well as online. #1 RULE: PERFORM NO WORK ON ANY OTHER ENTITY OTHER THAN YOURSELF UNLESS YOU HAVE INFORMED CONSENT! When you do have informed consent, only practice positive medicine. #2 RULE: It is never ethical to pray for an outcome to another individual’s situation because you are violating their free will and you do not have the ability to judge or intervene in their soul’s journey. Even if you are praying for them at their request, use the words “may this [request] be to their best and highest good.” The best way to support another individual is to share your talents and tools to assist them on their healing journey. #3 RULE: If you are working on the behalf of a client’s request, ask: Would you please give me permission for my spirit guides to access your spirit guides so that I can bring down the information for your highest good? #4 RULE: When creating your personal intentions, affirmations, and prayers, add the words, “let this be for my Highest Good.” Trust your Higher Self to know what is the best medicine for your soul’s journey. I have develop a course in Art Medicine that draws from many cultural sources, such as pagan magick, witchcraft and wizardry, African hoodoo, and Native American crafts. Comprehensive handouts include subjects such as: Introduction to Art Medicine; Ritual and Ceremony; Setting Intentions; Creating Petition Papers and Sigils; Consecrating Ceremonial Tools; Personal Concerns; Optimal Times to Create; Correspondences of Color, Numbers, and Woods; and Reading and Supply Resources. The course begins with a guided meditation journeys to a past life where the student has been an artist or craftsperson. The talent from that life is brought back to enhance the creative journey of this lifetime. A series of projects in the course include creating: Amulets and Talismans; Bath Salts; Candle Dressing; Corn Husk Dolls; Crystal Grids; Fairy Affirmation Kits; Fire Throw; Jizos; Magick Wands; Medicine Bags; Mojo Bags; Paper Skulls; Prayer Beads; Prayer Bundles; Sacred Herbs & Oils; Spirit Sticks; and Spirit Traps. This course supports personal journeys and transformations, as well as providing skills to create products that can be used as gifts, tools that can be used in sacred ceremonies, and product ideas that can be used for your personal business. No artistic talent is required for these projects. Just bring your intention. This course is available in person, over Skype, individually or in a group setting. If you are interested in getting on the wait list, please contact me.